My art’s aim is to grip the viewer, and then inspire the viewer to seek their own unique discoveries in each image. Each piece is an experiment in numinous intervention. The sensitive viewer completes the experiment. I came to my art practice as a matter of my lifelong drive to satisfy my curiosity. This demands that I continue to wander, experience, explore, do experiments. Creating visual pieces is a musical process of spontaneous conduction. My guiding intentions are to learn by doing experiments, discover unique territories, and, experience adventurous creative praxis. My intentional aim is that each image–art work–communicate for itself. Because I aim my art at creating an opportunity for the present and sensitive viewer to, as John Dewey put it, “have an experience,” my art is intended to be for all ages and for all time. The viewer’s time is the great gift which predicates their experience. My artworks privilege openness, presence, and curiosity. I’m drawn nowadays to the idea that experience of art is a way of listening to consciousness. Stephen Calhoun, born 1954 in Cleveland, Ohio USA, is a self-taught artist working in a variety of modalities, most prominently photography, mixed process photography, and generative art. His use of technology counts him exclusively as a digital artist since 2003. Before then he was a painter. However, as a visual artist his art is most deeply influenced by music and the nature of experience. He is an instrumentalist and composer, recording under the name Kamelmauz between 2001-2015. As well, he is a theorist and researcher in the field of experiential learning and its role in adult development. He is retired, having worked in organizational development and the music business. 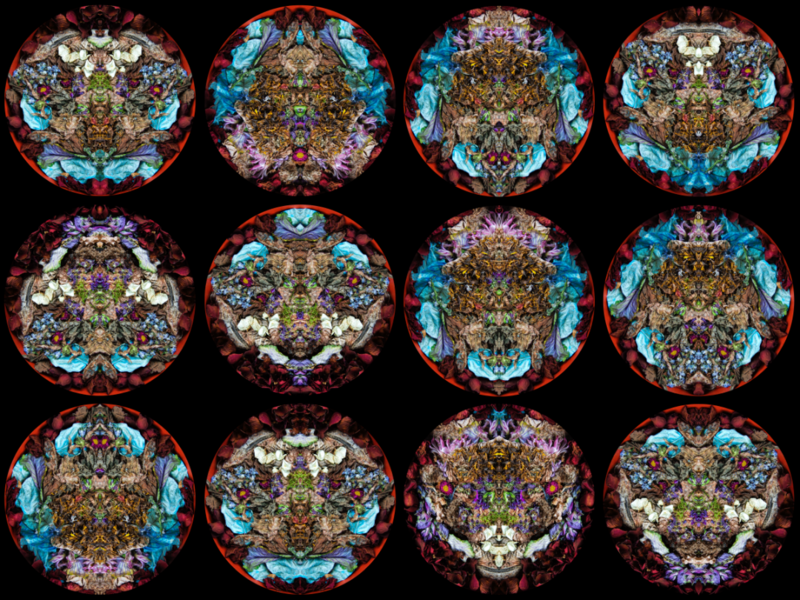 His recent work is centered on applying geometric iterations and mirror symmetries to source images. Most often the source materials are a still life he constructs in his outdoor or indoor studio from a vast inventory of organic and found and sculptural material. I conduct ensembles—the congerie—of materials made up of combinations of flowers, dried leaves, figurines, and found objects. I photograph these set-ups to be shaped into mirror symmetries. Next I apply technological processes to alter slightly, or greatly, the original image. My sensibility is through-and-through experimental, musical and improvisatory. Stephen Calhoun’s creative projects have in their background his theorist/researcher’s interest in: serendipity, generativity, and radically empirical experience in adult learning and development. His creative approach in its essence joins a musical process with experiential openness to the numinous. An accidental artist, nevertheless his creative vision follows ineluctably from his great love for sound and his deep curiosity about the nature of human experience. Starting as a self-taught graphic designer in 1985, he painted from 1993-2002. He took up procedural, generative digital art in 2003. In 2009, he took up digital photography, and soon began fusing photography with generative procedures. He has worked exclusively in the digital domain since 2003. His experiments have focused on complexity and symmetry since 2012. He considers himself to be an untutored, self-taught, resourceful and attuned, artistic experimenter. His term of art for most of his work is: mixed process photography. Across creative and scholarly domains Stephen is all about being enveloped by experience for the sake of exploration, learning how to learn and unlearn, and, leveraging spontaneous insight. His current artistic catalogue of archival prints to paper, aluminum, vinyl, acrylic, and glass is available variously in single editions, final editions (that add a single artist’s proof to the edition,) and limited editions. Additionally artworks are available through emergART, Oh Good Party (Shanghai,) and Saatchi.